Any smart applicant knows that starting your response with the words, “Well, I’ve been drawing ever since I can remember…” is like purchasing a one-way ticket to rejects-ville. If the reviewer hasn’t already heard that response a hundred times before (highly unlikely), well then it’s still a pretty generic foot to start out on, even if it’s completely the truth. Yes, you loved crayons as soon as you realized that they were for more than eating. Yes, you eventually graduated to the colored pencil, and then the elite marker pen. You relished the feeling of finger paint against newsprint and then delighted at the discovery of a paintbrush. Yes, these are all things that are true. But they are true about most artists, honestly, and while they set you apart from many others, they don’t set you apart from others of your kind. So, then, what do you say about yourself to let the world know how serious you are about what you want? How do you convey your dedication, skill and incredible imagination to those people who sit there reading essays all day, deciding whether to accept or deny you? How do you create a portfolio that wows the critics? And how do you do it all without getting discouraged, exhausted or totally confused? Luckily, being the artist that you are, you get two chances to prove your point: the essay and the portfolio. You get to tell your story twice, which is both an advantage and a challenge (especially if words aren’t exactly your forte). And you are also lucky in that you are not the first one to go forth and apply. Many artists have bravely gone before you and have made mistakes that you can learn from. They’ve helped to fine-tune the mentorship program and your teacher. Most importantly, they’ve had major successes that can inspire you and remind you that this (sometimes majorly frustrating) process is all worth it in the end. Here’s your opportunity to learn from the guinea pigs. When I first met Spencer I was probably six or seven years old and he was probably wearing a dinosaur t-shirt. I didn’t know a whole lot about him at the time–other than the fact that he really loved enormous extinct lizards– but what I know now is this: he’s been drawing ever since he can remember. Yeah, I know I just said you should never ever write that, but hey, I already applied to art school, so now I can say whatever I want, right? My true point is this: Spencer Epps has spent a heck of a lot of time developing his skill, and as a recent graduate of Otis College of Art and Design, he’s spent at least the last four years with his nose between the pages of a sketchbook, or his hand glued to a stylus. With a sweet job in LA and his graphic novel (a collaboration with fellow Otis grad Steve Mercer entitled Visum: Gaurdian of the Gates) about to be published, life is pretty dang good. Here’s what he had to say about applying for college, getting there, and preparing for the real world. Q: What made you decide you wanted to attend art school in the first place? A: I have always had an interest in art growing up, and only seriously considered art school in the later half of high school after attending classes as SAI. I really wanted to go once I learned a little more about it because I loved art and I felt that I could keep improving. Q: What were some deciding factors when choosing the school that was the best fit for you? What parts of the application process seemed most pivotal (both in the sense of being accepted and in being prepared for college once you arrived there)? A: Some of the deciding factors include location, what types of classes were available and class size. Price too, of course. Before attending college I based my decision on the fact that Otis had a foundation year that covers all the basic art principles which gives you a year to really investigate what you would like to declare as your major before committing to anything. Being able to experiment and also speak and see what all types of majors did was very helpful. 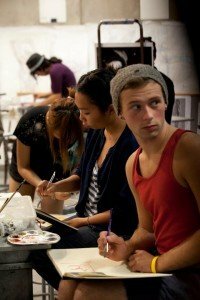 Choosing a school that has a good reputation for friendliness between the different majors is a must. The portfolio was the most important part of the application, and once you graduate it is still the most important aspect of your college career. Good grades and a decent essay are also important, more so for being accepted than once you are there. Once you arrive you have to manage your time well between bookwork and portfolio development, and portfolio development should always come first. It’s a very different mentality than high school. Q: What was the best part of art school? What was the most challenging? A: The best part was being around people who love what you love, from faculty to fellow peers. Everyone has an interest in what you are interested in. Also the best part is when you got to create what you want, by the time you reach your senior year you have learned enough to be able to actually put professional things together the way you want to. Its just feels great to be able to be in charge of a project and have it turn out the way you planned. The most challenging was balancing everything, your time management. You have to get used to the idea that while it will be fun it is still work, and you just have to be willing to put the time into it, nearly all of it, and just know that it’s only four years and wont last forever. It will be stressful and the closer you come to the end the more stressful everything becomes. Just keep your perspective in check and evaluate whether what you are freaking out about is really worth the worry. Q: How do you feel SAI prepared you for Otis? What else do you wish you would have known before arriving? A: SAI prepared me well, I had a strong portfolio, and taking life drawing helped immensely, as did learning to push my ideas further and further. Before going to Otis I would have like to have known more about the majors, I glanced at them but I think doing more research would have given me a better concept about what the school offered. Other than that practicing all of the basics from drawing to perspective to color theory more would have been helpful. Getting all of the general concepts really nailed down before attending an art school will give you the upper hand. Q: Tell us about your collaborative project with Steve Mercer, where the idea came from, and what the process of creating your own graphic novel was like? A: My project with Steve was a 52 page graphic novel that stemmed from an idea about what was important to show in our portfolios. If you are looking to go into concept art for animation, your portfolio needs to encompass character design, background design, the ability to communicate a story, color theory, expression, composition, and style. We felt the best way was to work together to create a visual story from beginning to end to show that we could take a project to full completion. The process was long, creating the right story took the longest, once that was down (which took a few months), we decided what visuals needed to be seen in order to tell the story. So we penciled out roughly each scene, which also took a few months, talking about how to make each pannel interesting, where the text would go and how it would look next to another page. After that we had to decide what the characters where going to look like and how we were going to render them so they looked the same in each page. While coming up with the characters we also had to come up with a style guide to know what the backgrounds where going to look like. After that we sat down and took about five pages at a time and came up with a color palette that matched the mood of the scene. Once we had the whole color layout for the story we went back and cleaned up each pannel. We ended up doing three pannel clean ups, touching up each page three times before coming to the final. Then once everything was painted we placed in all the word bubbles in their allotted space and typed up the story and did some final editing. Steve and I did everything together, the work load was split 50/ 50 and the only way we accomplished it was by devoting a ton of time to it. It was a major learning experience, working so long and so closely with one person you realize how important listening and taking advice can be. Q: How did it feel to finally see your book published after working so hard on it for so long, and after being so dedicated to soliciting support from family and friends? A: It feels amazing! Everyone was so supportive and positive, it is just great. To finally accomplish the novel and have people excited to see it was a wonderful payoff. Q: What has your experience been post-art school as far as finding a career to settle into? A: Since graduating, Steve and I have been working at a small studio doing the art for a video game. One of our professors recommended us for the job after seeing that we worked well together on the comic and were able to meet our goals. We were very lucky. Q: What is your job now? A: [Spencer is currently a freelance concept artist working on videogame productions at Tigar Hare Studios in Los Angeles.] A regular day at Tigar Hare consists of going in around 10:00 am, checking with a producer to see what the client is looking for, and then spending the the rest of the day painting up whatever was asked for and then maybe having a brief meeting about it. After that we are out by 7:00 pm. Some days are longer, some are shorter. Q: What advice do you have for high school seniors trying to make their final choices about college? A: Ask yourself what sounds like the most fun, and then see what schools offer that specifically! Research and see what the schools offer for classes, and also look and see what types of careers are out there. If you have no idea, look for a school that really covers the basics well and gives you time to choose your major after the first year. Visit if you can, and talk to people attending the school, im sure they will have much to share. Q: What are your long-term career goals, where might you see yourself in 5 years? A: This industry fluctuates a lot, and opportunities seem to open and close all the time. Five years form now I hope to be established at a studio, not doing freelance, and hopefully this will happen within a year let alone five. It is hard to tell where you can end up, in the coming years I hope to work on more games, commercials, and finally films. Eventually I would like to manage an art department, and maybe even make my own film. You never know! Check out these links to learn more about what Spencer’s been up to! WOW! This is a treasure chest of tips, tricks, and inspiration! It’s wonderful to see your successes, Spencer, and get a glimpse of the application and dedication it took to reach them. My comment reflects my experience of giving a few master classes, lectures and talks at the SAI. Spencer was an obvious talent, no question about it, but what is more interesting (because there are many more with talent at SAI) is that Spencer was different in his approach. You could count on him bringing a fresh angle to his project. And the principal teacher, Ms. Brudnicki, knows how to support the uniqueness in every student. Good luck, Spencer.